As well as active caving, there are a number of members of the DCC whose activity extends to visiting abandoned mines around the country. Some of these visits are purely exploratory but others are to try to extend the known limits of the mines or to re-open abandoned mines that have long been closed. and of course Alderley Edge. For more details, follow the links. 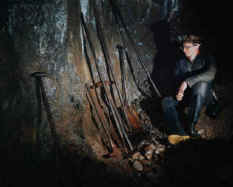 The picture above shows Pete Johnson of the DCC looking at an abandoned set of miners' tools in Brownley Hills Mine in Cumbria. Tools and other artefacts such as these are left in place for future generations to see. Minerals are also left in place and not removed wantonly or for profit. To see some pictures, have a look at our mining photo gallery. We have a page with information about NAMHO, the National Association of Mining History Organisations, which acts as a national source of information and guidance about mines in the UK. NAMHO also holds regular conferences and field trips.